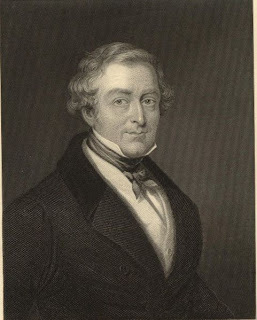 This is Robert Peel, the Prime Minister of Great Britain. Today, January 22, he is at the height of his power. His Tories command the majority of Parliament. He rises to commence his speech announcing his switch from protectionist trade policies to free trade ones. He gave a detailed examination of the specific bill that would trigger the switch: the repeal of the Corn Laws. Lord John Russell, the opposition Whig leader followed with another detailed exposition in support. There was the specific bill of corn prices. There was the larger issue of Free Trade versus Protectionism. Then there was the still larger issue of leaders taking first one side of an issue and then another. Peel, like many pols before and since, did not feel he needed to address those larger matters. Then a young upstart, Benjamin Disraeli rose. Let men stand by the principle by which they rise, right or wrong. I make no exception. If they bewrong, they must retire to that shade of private life with which our present rulers have so often threatened us. . . . Do not then because you see a great personage giving up his opinions – do not cheer him on, do not give so ready a reward to political tergiversation. Above all maintain the line of demarcation between the parties, for it is only by maintaining the independence of party that you can maintain the integrity of public men and the power and influence of Parliament itself. More information: Robert Peel, Benjamin Disraeli, Corn Laws.